Fiction – paperback; Text Classics; 495 pages; 2012. First published in 1963, Sumner Locke Elliott’s Careful, He Might Hear You is a big, beautiful, bold-hearted book set in Sydney during the Great Depression. It’s most definitely a five-star read. PS, short for postscript, is an “almost orphan”: his mother, the writer Sinden, died in childbirth and he hasn’t seen his father, the good-looking but feckless Logan, ever since he left to seek his fortune on the gold fields. Now in the care of his Aunt Lila (Sinden’s sister) and Uncle George, PS is a happy, well-adjusted six-year-old boy, adored by a big collection of crazy aunts. But things change when his well-educated, well off Aunt Vanessa, who lives in London, returns home to Sydney to take “proper care” of him. She’s a rather snobby character, who reflects the “cultural cringe” of the time and thinks nothing in Australia, including the accents, is good enough. In her pursuit to turn PS into a gentleman, he comes into her care on week days so that he can attend a private school and take extra curricular lessons, such as music and riding. He returns to Lila and George on the weekends. PS now finds himself caught between two worlds. His Aunt Ness doesn’t really understand children and wants him to act as if he’s very grown up. She’s needy, manipulative and cruel, forever trying to buy his affection with glamorous toys and expensive clothes. He suffers her over-bearing attitude with good grace, but he desperately misses Lila and George, who love him unconditionally and let him behave as a child. Eventually, things come to a head when he decides he no longer wants to live with Ness. The fall-out — on him, his trio of guardians, his long-lost father and the wider family — is predictably upsetting and heart-breaking. Yet despite the fact this is a story about an emotional tug-of-war over a defenceless child, this is a warm-hearted, rambunctious and truly memorable novel. It’s also a lovely, heart-swelling portrait of childhood in another age. It’s said to be based on the author’s own experiences growing up, which perhaps explains its charm and authenticity. There’s a lot going on in this book — about childhood and parenting, sibling rivalries, marriage, love and romance, death and the lies we tell children (and ourselves). As a portrait of a big, complicated family of women — their tensions, petty squabbles, foibles, flaws and strengths — it is superb. The individual characters of all PS’s aunts — the posh one, the sensible one, the fun one, the religious one — are beautifully drawn and wonderfully contrasted with his own dead mother, the woman with an angelic reputation who had a devilish streak few people knew about. The dialogue is witty, peppered with the vernacular of the time, and Sydney, in the heat, is captured so vividly it feels as if it’s a character in its own right. The 1930s setting is also particularly evocative. And it makes a wonderful addition to the canon of “aunts in fiction”, which includes some of my very favourite reads, including Robin Dalton’s memoir Aunts up the Cross, David Malouf’s epic novel Harland’s Half-Acre and Graham Greene’s hilarious Travels with my Aunt. Careful, He Might Hear You won the Miles Franklin Literary Award in 1963. I read this many years ago when the mini-series was filmed (Aus always did very good mini-series in the 80s and 90s) but have forgotten lots of the detail – probably time for a reread. I have vague memories of the mini series…I just remember Wendy Hughes as Aunt Ness (that’s her on the cover of the book; the artwork is based on a still from the TV series). Yes, you should, Guy. I really loved this novel. 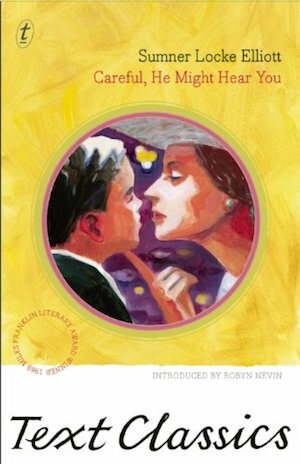 It’s so evocative of another time and place; love Depression era novels from Oz. Kate, I read this long ago too when it was made into a film – Wendy Hughes was superb as Aunt Ness! Oh this sounds excellent, not one I’d heard of before. And aunts are great, aren’t they! It’s an old Australian classic but deserves an international audience because it is about universal themes. I really adored it (in case you couldn’t tell from my reivew) and now I want to read more by him.